Route Sales Driver is responsible for delivering the products to the customers at their desired venue. The route sales driver executes or performs various other roles as a part of the job description, which can consist of some or all of the following – driving vehicles to point of delivery, maintaining stocks or products, merchandising the goods in a safe manner, retrieving damaged goods, maintaining the vehicle in good condition, handling cash, and taking extra care while delivering food or perishable goods. 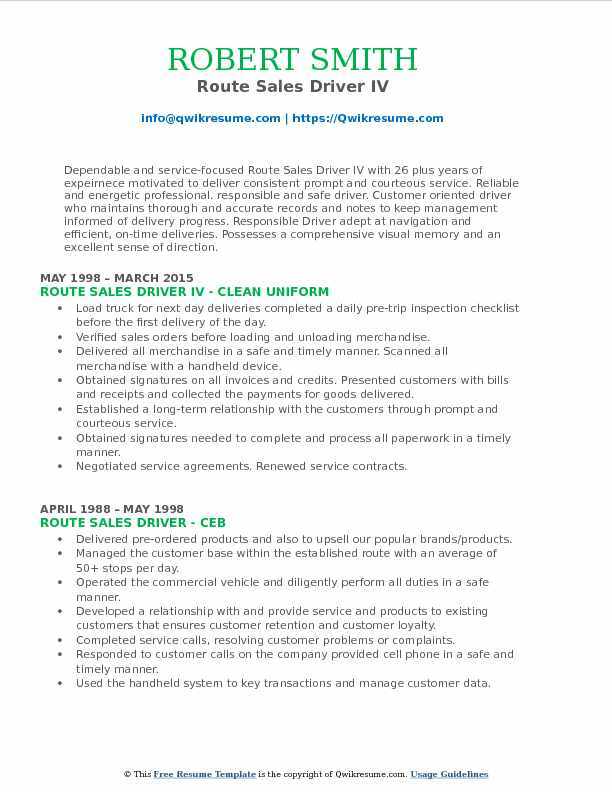 Headline : Service-oriented Route Sales Driver with 6 years of background in customer service. Core competencies include dependability, dedication, and integrity as well as excellent communication and time management skills. Handles tasks with accuracy and efficiency. Collecting money from customers, making a change, and recording transactions on customer receipts. Driving the trucks to deliver frozen food items to customers on a bi-weekly basis. Informing the regular customers of new products or services and price changes. Calling on prospective customers to explain company services or to solicit new business. Arranging the merchandise and sales promotion displays or issue sales promotion materials to customers. Listening to and resolving the customers' complaints regarding products or services. Maintaining the trucks and food-dispensing equipment and clean inside of machines that dispense food or beverages. Providing services to customers, such as order placement or account information. 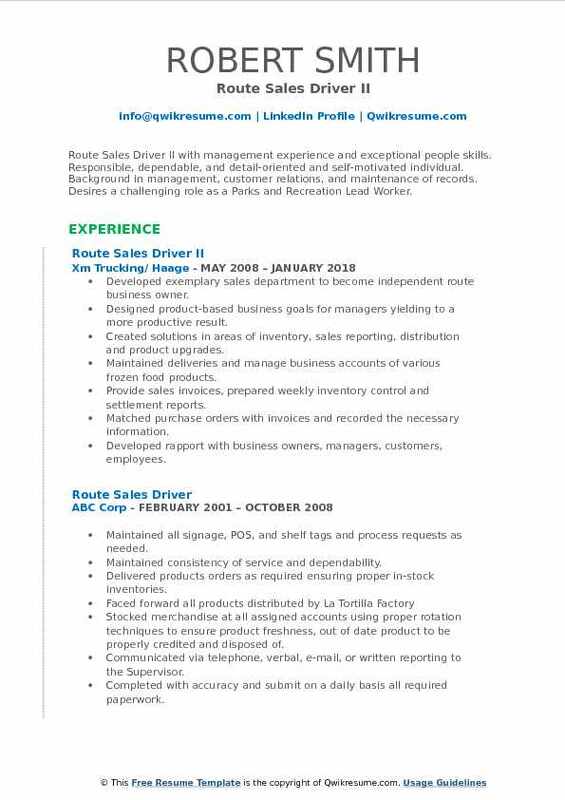 Summary : Route Sales Driver with 20 plus years of expeirnece wants to obtain a challenging position within a professional organization to utilize my experience in customer service, sales, and deliveries. Drove/processed route delivers to various customers in the MD, DC, VA area, and navigated the various routes. Security clearance to deliver to various high-level agencies in the Fort Meade and DC area, to include FBI, military installations, etc. Responsible for inventory of bakery products and loading of products into the delivery truck prior to delivery. Performed pre-truck inspections and documented them in a DVIR, to include any maintenance issues that needed to be addressed. Member of the safety committee, reviewed other drivers accident reports to see if accidents could have been prevented or not, documented how it could be prevented so others don't make the same mistake. Ensured employees union rights were not violated by the employer. Conducted customer surveys and utilized the feedback to improve customer relations. Designated as a backup driver to assist other route drivers when they called out or were on vacation. 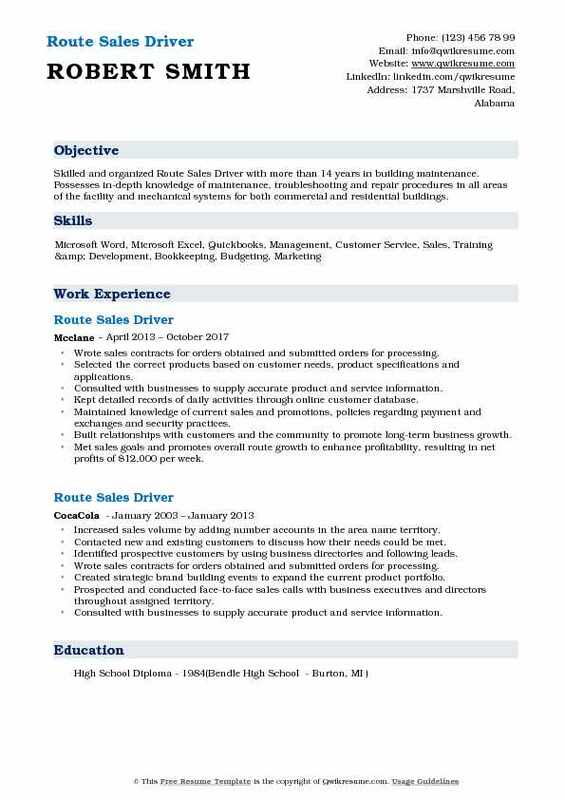 Summary : A Route Sales Representative/Driver with 16 years experience managing the delivery, selling, merchandising, ordering and distributing an entire baked food line to accounts on a daily basis. 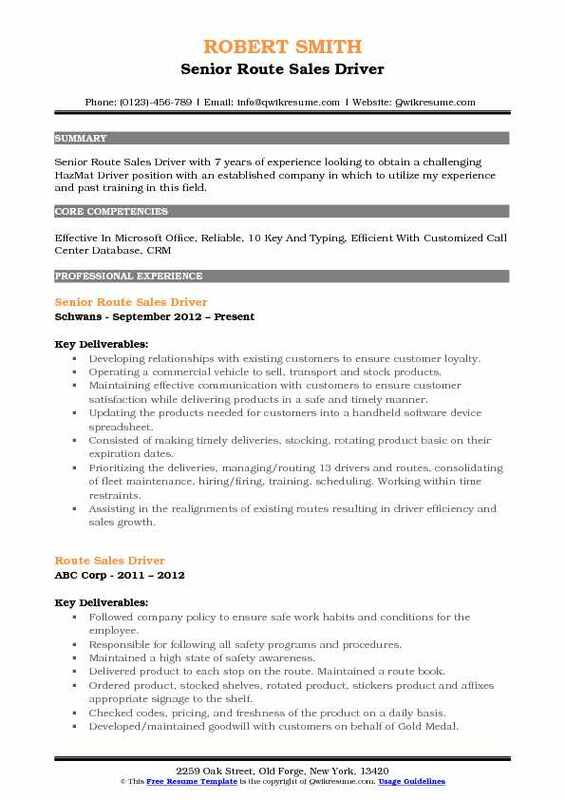 Maintains a relationship with store managers and personnel and advises them on upcoming promotions and displays. Thorough, reliable and self-disciplined. Highly organized with acute attention to detail. Exceptional capacity to multitask. An excellent, safe driver who obeys traffic laws and has had no accidents or injuries. Checking load for the days delivery, reporting all short or damaged product. Managing the orders, loading and securing the product on the truck and unload delivered product. Serving each customer on a daily basis in a timely and courteous fashion. Knowing the customer's procedures for checking the product in/out at each account. Sold, merchandised, ordered and distributed the entire baked food line at each account. Processed all orders in a timely fashion, settled up accurately, turn in all paperwork, authorized charges, book accounts, cash sales and voids on a daily basis. Communicated with the Store Managers and Personnel on a daily basis about upcoming promotions and displays. Responsible for taking orders, selling the product, delivering the product, and customer service in the assigned area. Summary : Route Sales Driver II with management experience and exceptional people skills. 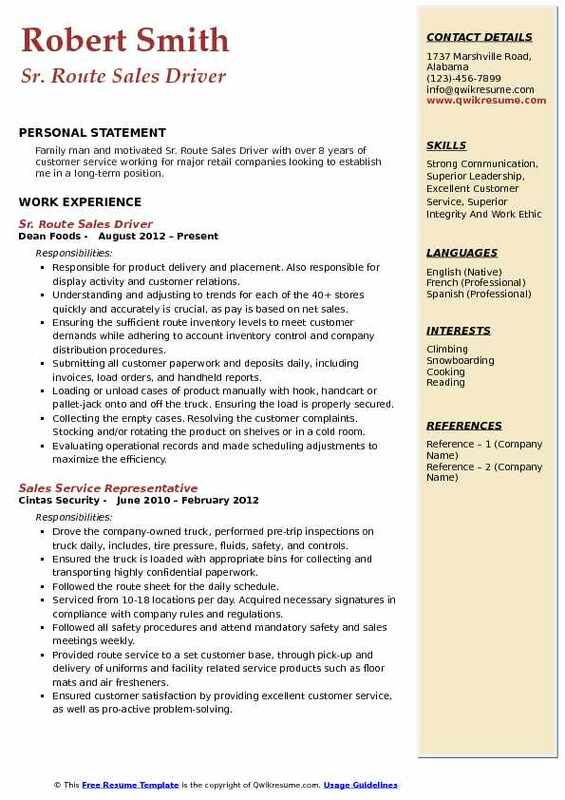 Responsible, dependable, and detail-oriented and self-motivated individual. Background in management, customer relations, and maintenance of records. Desires a challenging role as a Parks and Recreation Lead Worker. 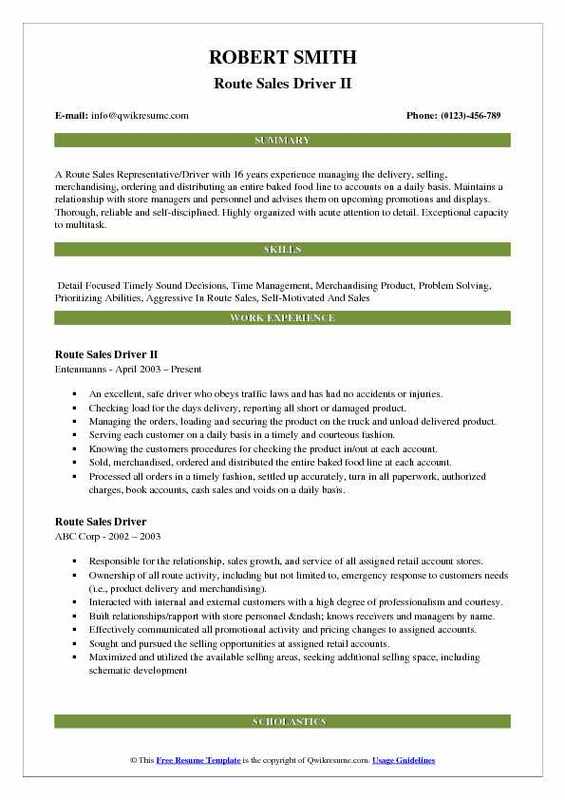 Developed exemplary sales department to become independent route business owner. Designed product-based business goals for managers yielding to a more productive result. Created solutions in areas of inventory, sales reporting, distribution and product upgrades. Maintained deliveries and manage business accounts of various frozen food products. Provide sales invoices, prepared weekly inventory control and settlement reports. Developed rapport with business owners, managers, customers, employees. Coordinated, scheduled and executed the ongoing ordering and delivery of perishable product to all assigned accounts. Safely operated a company step van in a designated area to provide products and service to over 40 clients on a weekly basis. Summary : Route Sales Driver I with 11 years of expeirnece wants to use my current driving licensing and experience to safely and efficiently provide excellent service to existing and potential customers in the delivery/environmental services industry. Delivered 5-gallon bottles and case product to existing and potential residential/commercial customers. Was recognized several times for being accident and injury free for over 3,000+ days. Ran safety meetings occasionally and have focus groups on how we as a company can be safer. Held routes in several zip codes in south county, east county, north county and the coast. Also volunteered to work in San Bernardino to assist another branch for two weeks. Worked several Saturdays and long hours during the week to help assist in finishing work that was assigned to me and assisted other co-workers. Actively managed the end-to-end relationship of a regional portfolio of seventy-nine accounts ensuring complete satisfaction. Reviewed customer invoices daily for complete and accurate account information to ensure timely delivery of products. Developed leads, prospects and called on prospective customers to solicit business, prepare service agreements, and install new accounts. Summary : Skilled and organized Route Sales Driver with more than 14 years in building maintenance. Possesses in-depth knowledge of maintenance, troubleshooting and repair procedures in all areas of the facility and mechanical systems for both commercial and residential buildings. Selected the correct products based on customer needs, product specifications and applications. Met sales goals and promotes overall route growth to enhance profitability, resulting in net profits of $12,000 per week. Identified opportunities to acquire long-term customers to support route growth. Completed service calls, resolve customer problems or complaints. Responded to the customer. Summary : Dependable and service-focused Route Sales Driver IV with 26 plus years of expeirnece motivated to deliver consistent prompt and courteous service. Reliable and energetic professional. responsible and safe driver. 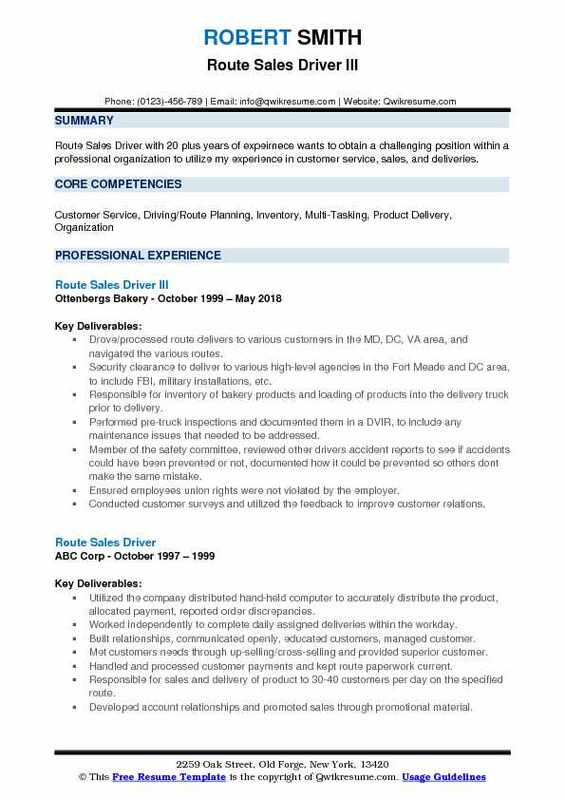 Customer oriented driver who maintains thorough and accurate records and notes to keep management informed of delivery progress. Responsible Driver adept at navigation and efficient, on-time deliveries. Possesses a comprehensive visual memory and an excellent sense of direction. Load truck for next day deliveries completed a daily pre-trip inspection checklist before the first delivery of the day. Verified sales orders before loading and unloading merchandise. Delivered all merchandise in a safe and timely manner. Scanned all merchandise with a handheld device. Obtained signatures on all invoices and credits. Presented customers with bills and receipts and collected the payments for goods delivered. Established a long-term relationship with the customers through prompt and courteous service. Negotiated service agreements. Renewed service contracts. Checked vehicles fluid levels and tire pressure and scheduled any required repairs. 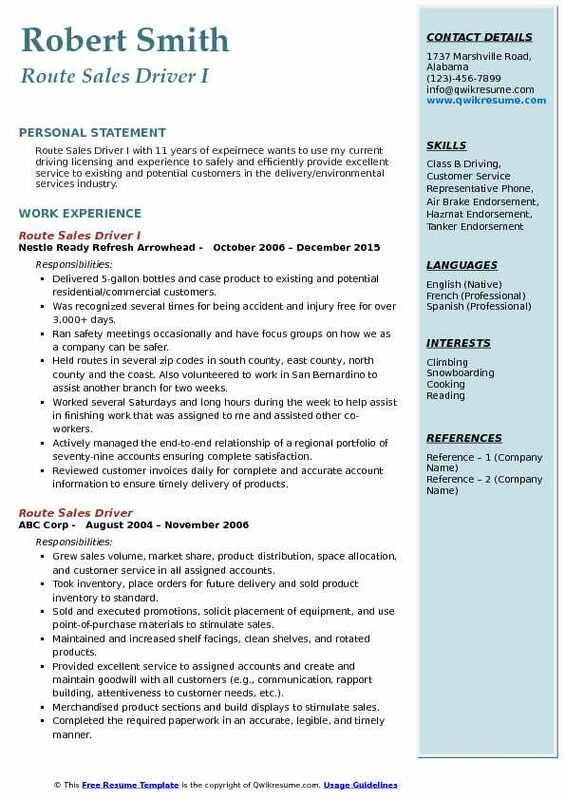 Summary : Senior Route Sales Driver with 7 years of experience looking to obtain a challenging HazMat Driver position with an established company in which to utilize my experience and past training in this field. Developing relationships with existing customers to ensure customer loyalty. Operating a commercial vehicle to sell, transport and stock products. Maintaining effective communication with customers to ensure customer satisfaction while delivering products in a safe and timely manner. Updating the products needed for customers into a handheld software device spreadsheet. Consisted of making timely deliveries, stocking, rotating product basic on their expiration dates. Prioritizing the deliveries, managing/routing 13 drivers and routes, consolidating of fleet maintenance, hiring/firing, training, scheduling. Working within time restraints. Assisting in the realignments of existing routes resulting in driver efficiency and sales growth. Spearheaded several large delivery events with $10,000 or more in sales per event. Leveraged sales abilities to increase depot weekly sales average by $10,000 during tenure. 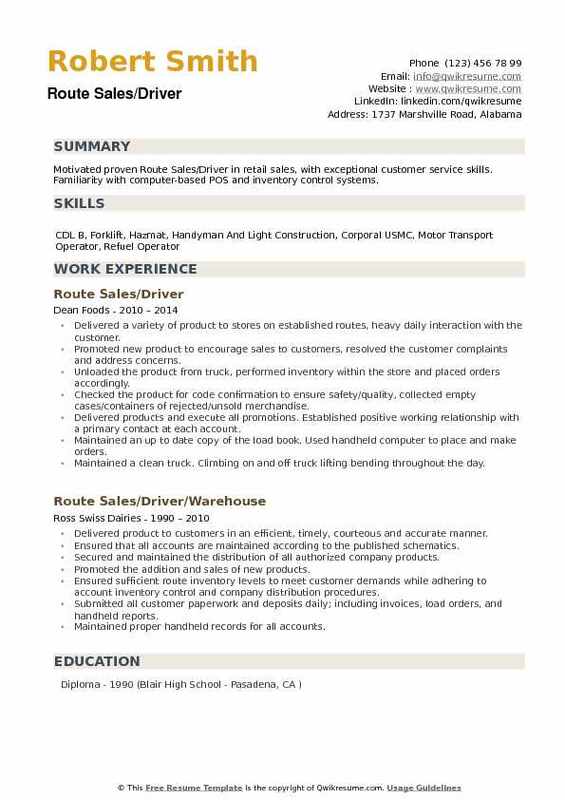 Summary : Family man and motivated Sr. Route Sales Driver with over 8 years of customer service working for major retail companies looking to establish me in a long-term position. Responsible for product delivery and placement. Also responsible for display activity and customer relations. Understanding and adjusting to trends for each of the 40+ stores quickly and accurately is crucial, as pay is based on net sales. Ensuring the sufficient route inventory levels to meet customer demands while adhering to account inventory control and company distribution procedures. Submitting all customer paperwork and deposits daily, including invoices, load orders, and handheld reports. Loading or unload cases of product manually with hook, handcart or pallet-jack onto and off the truck. Ensuring the load is properly secured. Collecting the empty cases. Resolving the customer complaints. Stocking and/or rotating the product on shelves or in a cold room. Evaluating operational records and made scheduling adjustments to maximize the efficiency. Evaluating and reconfiguring the systems to support customer service and operational. 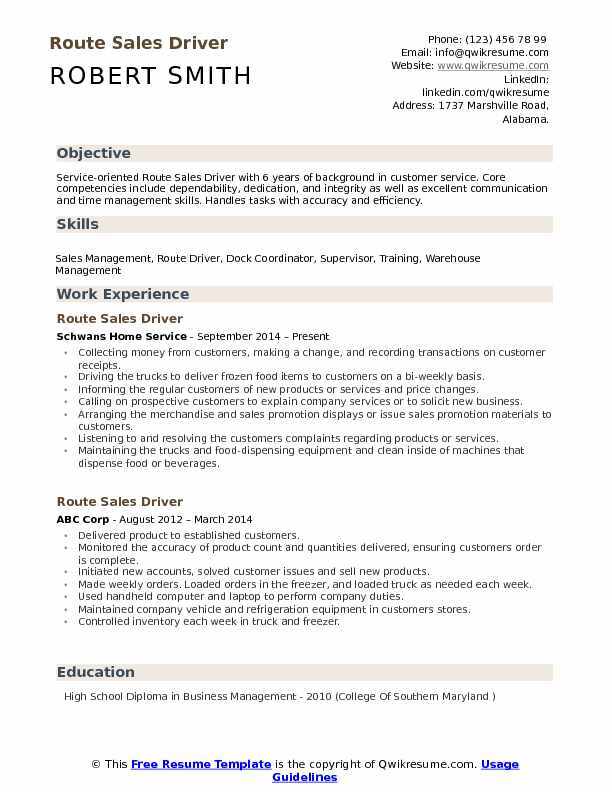 Summary : Motivated proven Route Sales/Driver in retail sales, with exceptional customer service skills. Familiarity with computer-based POS and inventory control systems. Delivered a variety of product to stores on established routes, heavy daily interaction with the customer. Promoted new product to encourage sales to customers, resolved the customer complaints and address concerns. Unloaded the product from truck, performed inventory within the store and placed orders accordingly. Checked the product for code confirmation to ensure safety/quality, collected empty cases/containers of rejected/unsold merchandise. Delivered products and execute all promotions. Established positive working relationship with a primary contact at each account. Maintained an up to date copy of the load book. Used handheld computer to place and make orders. Maintained a clean truck. Climbing on and off truck lifting bending throughout the day. Collected cash, checks and money order from clients. Loaded the truck at end of the day for next day work.